The dramatic and largely unexpected collapse in oil prices has sparked intense debate over the causes and consequences. This column argues that a broader energy perspective is now needed to comprehend oil’s long-term outlook, and provides answers to several questions about the oil market in the global economy. 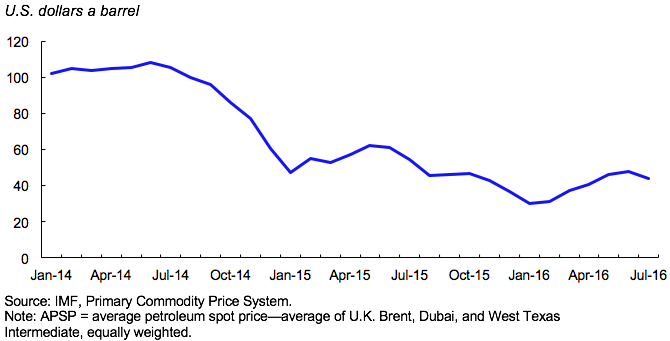 Oil prices have decreased by about 65% since their recent peak in June 2014 (Figure 1). This dramatic and largely unexpected (Baumeister and Kilian 2016) collapse in prices has sparked intense debate over the causes and consequences. Arguably, the dynamic adjustment has changed the oil market structurally, leaving it quite different from the past. In addition, the manner in which falling oil prices affect the global economy has changed in important ways. 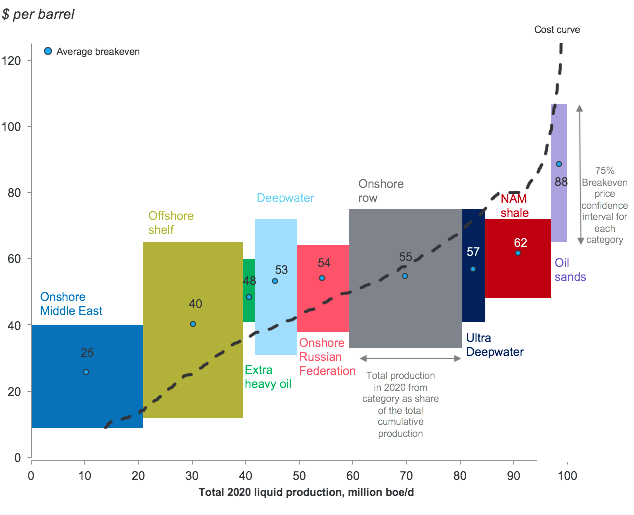 A broader energy perspective is therefore now needed to comprehend oil’s long-term outlook. To this end, this column briefly answers seven questions about the oil market in the global economy. Question 1: Is the slump attributable to a ‘supply glut’ or to ‘peak demand’? The evidence suggests that supply factors are better at explaining the initial collapse in oil prices in 2014 than demand factors. A host of issues are involved, including the rapid increase in shale production in the US; a change in strategy in Saudi Arabia, the largest member of Organization of the Petroleum Exporting Countries (OPEC); higher-than-expected output in locals such as Libya and Iraq despite ongoing conflicts; the return of Iranian oil to international markets; and the US’s removal of the oil export ban (Arezki and Blanchard 2014). These factors have persisted. The dynamic adjustment of investment in the oil sector to lower prices will continue to shape the speed and extent of any market recovery (IMF 2015). Demand factors have also played an important role (Baumeister and Hamilton 2015). Yet oil demand has grown unabated since 2011, when growth in emerging markets first slowed. Of course, changes in expectations about future oil demand may also explain this delayed market response. Specifically, the realisation has been gradual that the slowdown in emerging markets is structural, not cyclical. In addition, several episodes of market fright, when oil prices further collapsed before rebounding – at the end of August 2015 and January to February 2016 – suggest that financial factors are also relevant (Arezki and Matsumoto 2015a). Question 2: Does OPEC (still) matter? In theory, the effectiveness of a cartel and its compact depend on the strength of demand and supply outside the cartel. In the 2000s, strong demand and a relatively strong OPEC enticed investment and production in high-cost locals (such as oil sands in Canada and ultra-deep-water oil off Brazil). Considering the delay between investment and production for (conventional) oil, production in non-OPEC locals peaked about the same time as emerging market economies began slowing and expectations for future demand began faltering. In response, OPEC-dominant and lowest-cost producers changed strategies. In the past, Saudi Arabia would stabilise prices by cutting production when prices fell too much and raising it when they rose too high relative to a stated price target. In 1986, Saudi Arabia attempted to cut production by an unprecedented margin to support prices even as non-OPEC production rose rapidly, and the cut failed in its goals. Perhaps learning from the episode, this time around the country instead announced it would step up production, effectively crowding out high-cost producers. Observers expect the change in strategy to last to allow time for it to succeed. Question 3: Is the shift in cost structure permanent or temporary? The short answer is the shift is temporary. An important fact about the slump in prices is the significant downward shift in the cost structure associated with oil production. A commonly held belief is that the cost structure – which is often proxied by breakeven prices (the price at which it is economical to produce a barrel of oil) – is constant and driven by immutable factors such as the nature of the oil extracted and the associated geology (Figure 2). In practice, the cost structure depends on a host of factors, including technological improvements and the extent of ‘learning by doing’. In instances such as the recent dramatic drop in prices, breakeven prices have moved downward in sync with oil prices. That shift is explained by the operational efficiency gains stemming from the service industry’s significant reduction in margins to support the upstream sector. In shale oil specifically, the extraordinary resilience to the drop in oil prices can be explained by important efficiency gains compounded by the fact that shale was at the onset of an investment cycle in which learning by doing was important. Going forward, the shale cost structure is likely to shift back up somewhat because some of the efficiency gains cannot be sustained and the cost of capital is high. Source: Rystad Energy research and analysis. Note: boe/d = barrel of oil equivalent per day, NAM = North American. Question 4: Do futures markets (truly) reflect market sentiments? Futures have not helped predict market ‘breakdown’. Market expectations for the trajectory of oil prices, as captured by longer-term futures (only), changed after the OPEC meeting of late November 2014, adding to evidence that suggests that futures markets appear to ‘learn’ only gradually (Leduc et al. 2013). Oil futures curves gradually ratcheted up throughout the 2000s until reaching a peak just before they abruptly ratcheted down at the end of 2014. The limitations associated with futures are at least twofold. First, while they are large in absolute size they are in fact relatively thin after 12-18 months when considering the volume traded relative to the volume actually consumed. As such, futures do not necessarily reflect volume traded over the counter. Second, as in other commodities, futures markets are subject to the imbalance between longs and shorts. In other words, there is a higher demand for short-term hedging, say, by oil producers than long-term hedging by manufacturers. The former are typically willing to accept relatively lower prices to hedge price risks since they cannot easily pass on the price change to the consumer, contrary to oil and gas intensive manufacturers attempting to protect their cost structure even if oil is relatively small relative to their overall cost base. Question 5: Why have low oil prices not (yet) boosted the global economy? While a drop in oil prices amounts to a transfer from exporters to importers, the expected net plus stems from the higher propensity to save of the former. Also, it is important to distinguish between supply-driven oil price shocks and demand-driven ones, as the former should lead to a net plus to the global economy and the latter are symptomatic of a slowing global economy (Husain et al. 2015). Several reasons explain the limited effects of lower oil prices on the global economy (Obstfeld et al. 2016). A bigger-than-expected fall in capital expenditure in the oil sector, especially in North America, has been a drag on the world economy and trade. Oil exporters have experienced greater-than-expected reductions in (government) expenditures across the board. This has led to lower energy subsidies, social services, infrastructure investment, and, in turn, imports from advanced and emerging markets. Pressure has also increased to draw down sovereign wealth fund assets, with potential consequences for financial markets against the background of concern about market liquidity (Arezki et al. 2015b). In advanced economies, consumers seem to have saved a large share of the reduction in the net oil import bill. And in emerging markets, limited pass-through from international to domestic prices meant that the windfall was not spent, although it led to improvement in government balance sheets. The appreciation of the US dollar has limited the reduction in domestic currency oil prices somewhat. Importantly, interest rate policies are constrained by a zero lower bound environment. Question 6: What to make of a (two-way) relationship between the ‘energy transition’ and oil prices? The energy transition refers to the shift toward lower-carbon or carbon-free energy, such as renewables. The expected ‘lower-for-longer’ oil price environment will likely delay the transition (Arezki and Obstfeld 2015). The transition also faces a host of challenges that will likely take decades to overcome (Arezki and Matsumoto 2015b). The future of oil will depend on the complex interplay between demography, technology, and public policy, affecting both supply and demand. In thinking about the future therefore one should think more broadly about energy. On the supply side, oil will increasingly face competition from other sources of energy, such as natural gas and renewables. Oil is for the most part used for transportation as products such as gasoline, diesel, and jet fuel. As energy-using technology evolves in the transportation sector toward wider use of hybrid and electric cars, compartmentalisation of the transport and electricity sectors is bound to disappear. That trend will likely further displace oil, to the benefit of natural gas first and then renewables (IMF 2016). In demand, countervailing forces are at work. On one hand, rapid urbanisation and growing middle classes in emerging markets, especially in Asia, will tend to push up demand for transportation and hence for oil. On the other, expected slower growth in emerging markets and public policies geared toward reducing emissions will improve oil efficiency and reduce oil demand. Question 7: Is it the end of peak-oil? The peak-oil hypothesis posited that oil supply would top out in the mid-2000s, precisely the moment when the shale ‘revolution’ started to take off. In many respects, this revolution can be viewed as an endogenous supply response to high prices in the 2000s, hence challenging the overly pessimistic view that geological factors were to limit supply (Arezki et al. 2015a). Beyond the response of technology to oil prices, the resource base (what is known about geology as opposed to true geology) depends on exploration. The evidence suggests that discoveries of oil (as well as other commodities) have occurred mostly in developing countries, including in Latin America and sub-Saharan Africa that only saw exploration once they become more friendly to such activities (Figure 3). That increase in discoveries in the southern hemisphere is likely to continue to support supply in spite of depletion of reserves in the northern and low prices (Arezki et al. forthcoming). That said, the risks that fossil fuel assets will be stranded (in other words, obsolete) are likely to leave many countries vulnerable, including to financial stability and bankruptcy risks (van der Ploeg 2016, Venables 2016). Arezki, R. and O. Blanchard (2014), “The 2014 Oil Price Slump: Seven Key Questions.” iMF Direct, International Monetary Fund, December 22. Arezki, R. and A. Matsumoto (2015a), “Metals and Oil: A Tale of Two Commodities.” iMF Direct, International Monetary Fund, September 14. Arezki, R., and A. Matsumoto (2015b). “Q&A: Seven Questions about Climate Change.” IMF Research Bulletin 16 (4): 1–5. Arezki, R. D. Laxton, A. Nurbekya, and H. Wang (2015a), “An Exploration in the Deep Corners of the Oil Market.” IMF Research Bulletin 16 (1): 1-4. Arezki, R., A. Mazarei, and A. Prasad (2015b), “Sovereign Wealth Funds in the New Era of Oil .” VoxEU.org, November 29. Arezki, R. and M. Obstfeld. (2015), “The Price of Oil and the Price of Carbon.” iMFdirect (blog), International Monetary Fund, December 2. Arezki, R., V. Ramey, and L. Sheng (forthcoming), “News Shocks in Open Economies: Evidence from Giant Oil Discoveries.” Quarterly Journal of Economics. Arezki, R., F. van der Ploeg, and F. Toscani (2016), “Shifting Frontiers of Global Resource Extraction: The Role of Policies and Institutions.” Unpublished. Baumeister C. and J. D. Hamilton (2015), “Structural Interpretation of Vector Autoregressions with Incomplete Identification: Revisiting the Role of Oil Supply and Demand Shocks.” Working paper, November. University of California at San Diego. Baumeister, C. and L. Kilian (2016), “Expecting the unexpected: Why the oil price keeps surprising us ”, VoxEU.org, 8 February. Eastwood, R. K. and A. J. Venables. (1982), "The Macroeconomic Implications of a Resource Discovery in an Open Economy." Economic Journal 92 (366): 285–99. Husain Aasim, M., R. Arezki, P. Breuer, V. Haksar, T. Helbling, P. Medas, M. Sommer, and IMF staff team (2015), “Global Implications of Lower Oil Prices.” IMF Staff Discussion Note 15/15, IMF, Washington. IMF (2016), “Special Feature: Commodity Market Developments and Forecasts, with a Focus on the Energy Transition in an Era of Low Fossil Fuel Prices.” World Economic Outlook. IMF. April. IMF (2015), Special Feature: Commodity Market Developments and Forecasts, with a Focus on Investment in an Era of Low Oil Prices, April World Economic Outlook. Leduc, S., K. Moran, and R. Vigfusson (2013), “Learning About Future Oil Prices.” Unpublished. Obstfeld, M., R. Arezki, and G. M. Milesi-Ferretti (2016), “Oil Prices and the Global Economy: It’s Complicated .” VoxEU, 13 April. van der Ploeg, F. (2016), “Fossil Fuel Producers under Threat.” Oxford Review of Economic Policy 32(2): 206–222. Venables, A. J. (2016), "Using Natural Resources for Development: Why Has It Proven So Difficult?" Journal of Economic Perspectives 30 (1): 161–84. These discoveries may have important macroeconomic consequences (Arezki et al. forthcoming, Eastwood and Venables 1982).